Oh it is the most wonderful time of year! I packed their backpacks, washed their faces, made them breakfast, emptied my wallet, and then sent them to school. School has been in session exactly 6 days - and for exactly 6 days I have received a note of some sort requesting me to pay for something to or for school. Prior to school starting I was met with the school supply list - I am pretty positive I have supplied the school (in the past 7 years) with 100 boxes of kleenexes, 50 rolls of paper towels, and why in the world did they need Mr Clean Magic Erasers this year? She is in 7th grade he is in 3rd - they are kind of grown out of major messes! Just hours after pulling up from school supply shopping, I opened my mailbox and discovered a letter from the school informing me that I needed to first pay for school lunches - okay the kids have gotta eat- but second pay the deposit/insurance for my daughters chromebook. Okay fine - she is an awkward 7th grader - so I footed the bill. First day of school those shining faces arrived home from school with more bills from the school. We have Beta dues, Pep Club dues, and I need reeds for my saxophone. Okay let me open my wallet a little wider - see what we can dig out of there. Day two of school, hey Mom, they sent home the school picture form - would you like to order photos - ummmm....NO let's just take a selfie and that will do. I can't afford these prices. On the third day of school "hey mom, coach said I needed to pay for my ball shoes before Friday" okay - there is turnip in the yard, go squeeze it and see if you can get blood from it. On the fourth day of school I received a lovely letter from the music teacher (who I truly adore and am thankful for) "hey mom I need money for a recorder - it is only $5.00" - okay can I just hand the school my checkbook and they balance it for me. On the fifth day of school "hey mom, coach said we could buy polo shirts to wear with khakis for game day - oh I need khakis, but could you pay for the polo today" yes of course - do you think they know my bank account number well enough yet - maybe they could direct withdraw. Now I love my kids and I love their school, but I am scratching my head as to how parents do this. Since August 1st, I have spent over $500 in either school supplies, or something that the school has requested for me to pay.....FOR REAL. I sat here tonight and stared at my checkbook and scratched my head. I live in a community where more than 20% of the population live at poverty level or below. To be considered at poverty level means the household income is less than $30,000 a year for a family of 4- which equals a gross income of $2500 a month! That is gross not net! Either way there is NO WAY a family of that income can afford to fork out $500 for school supplies, school lunches, school clubs, sports, and any other letter I received this week asking for money. Not to mention that is just for two kids - most families have more kids than me! I point no fingers - and I did pay for every item requested (after some grumbling to the husband) my question is why does the school administration not see this as an issue. Are they not aware of how poor people really are? 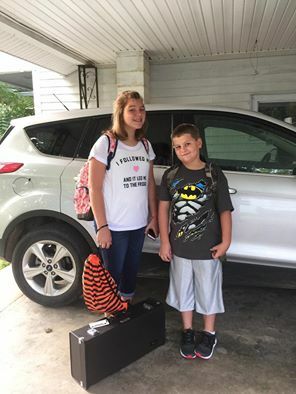 Do they realize that parents struggle to just get school supplies and then have to sacrifice school pictures because it is just not in the budget for that month? Do they think it is possible to spread these expenses out a bit - so the sticker shock does not come all at once? I wonder how many other parents are feeling this way - or is it just me?